Ender, how did I miss you? Last week I decided I was going to get around to watching Ender’s Game. Which meant I had to read the book first because I almost entirely skipped reading things from the sci-fi genre. I never cared for it when I was younger, but I may find that it has a place in my adult life. The audiobook version was decently voiced and on YouTube so I was able to settle in for some hours of listening while I played World of Warcraft with the sound off. Other family members who play don’t understand how I can enjoy playing WoW without the music, but to be quite honest I feel like I’m wasting time playing a game if I’m not also doing something else. After all these years of playing, WoW takes only a very small part of my brain to play so I’ve gotten into the habit of listening to books, courses, or catching up on news radio recordings while I play. I turned on Ender’s Game, and found myself hooked within 15 minutes. I also found myself doing things I had not done in a long time, maybe ever, with the things I listen to while I play WoW – namely that the book absorbed my interest so much, captivated my attention so completely, that I kept finding myself staring through my computer screen, my character long forgotten and sleeping on the ground, just listening intently to the story. Initially I’d planned to drag it out for a few days, but I ended up going through the 11+ hour audiobook in two sittings. Needless to say, I loved the book. I won’t go into the specifics of what I liked because I think everyone should read it. The only warnings I will give are that if you don’t like dystopian future stories, don’t care for outer space stuff and aliens – well you could try to read it, but that’s the setting for the book. Also if you happen to hold far-left political views and believe that population control, religious oppression, government control of children, and centralized one-world government are all great ideas… or if you’re right-wing and think that constant surveillance, military drafts, and world policing are all great ideas… well this book is probably going to ruffle your feathers. Boo hoo. I think I’ve mentioned enough of what is in the book now. But seriously, one note, don’t watch the movie if you haven’t read the book. The movie makes some changes which are a bit initially jarring for those who have read the book, but tolerable and acceptable considering time constraints. The actual problem I found with the movie was that it makes little references to things which are kind of complicated but just glosses over it and mentions it anyway. For instance, to someone who hasn’t read the book, people calling Ender a ‘third’ must be very odd and confusing. 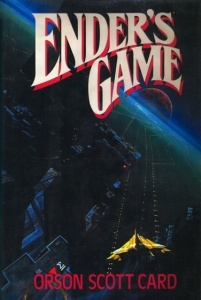 Regardless, this book has definitely awoken some additional interest in sci-fi for me, and I do think I will find myself reading more about that world, particularly the pre-Ender’s Game books to learn more about how the situation became what it was. Just a small reminder to always try new things, try again with things you tried long ago, and keep your mind open to new possibilities. The movie had great effects, but the story was flat. I followed your link and listened to the audiobook. I’m ready to watch it again, I think it will be better this time.